The Morning Star quilt block is made entirely of squares and triangles. It is a another block that is built on the Ohio Star pattern. There is nothing particularly difficult in the construction of this block except to be very conscious of keeping your seam allowance precise. 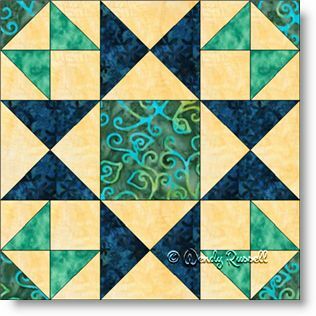 This block allows you to be very creative with your colour choices and you can certainly branch out to use more selections than I have chosen to use in this sample. The sample quilts shown illustrate two very different end results, simply by changing the layout of the quilt block and choosing different colour values for the borders and/or background fabrics.